Government websites need to address the needs of diverse audiences. Although translations are a first step towards engaging non-English speaking audiences, the intended audience may be alienated if information is not presented in a culturally relevant way. The National Cancer Institute (NCI) engaged in user experience research in order to better serve the U.S. Latino population. The research eventually led to the creation of Spanish language personas that NCI uses to design programs, products, and services that are culturally and linguistically appropriate. These personas can also be used by health organizations outside of NCI. NCI is the federal government’s principal agency for cancer research and training. Programs address the cause, diagnosis, prevention, and treatment of cancer, as well as care for cancer patients and their families. Persona development was led by Silvia Inéz Salazar, the Audience Research and Informatics Laboratory Manager at NCI. As a result of this prior research, NCI decided to explore both the linguistic and cultural issues that affect Latino engagement with health information. The NCI User Experience (UX) team conducted iterative testing and included users in the process. Initial testing allowed the team to identify key values, beliefs, and language practices of Latino users. Due to the large volume of research findings and reports, NCI project teams decided to create personas that could be used to reference the findings and to understand Spanish-speaking users throughout the development lifecycle. Each persona needed to be a realistic representation of target audience segments; therefore, data was collected from actual humans, not from hypotheses. NCI examined Google Analytics to understand how users access NCI content. They focused on browser type, device type, landing pages, and length of visit. NCI also used reports by the Pew Research Center and Forrester Research to create descriptions of personas’ incomes, housing, and family sizes. For details such as music and entertainment preferences, they looked at public data, such as Nielsen’s weekly ratings. These data points were vital for fact-checking. For example, NCI checked that personas’ Internet behavior matched Google Analytics and that characteristics like income, family size, and education aligned with the cities where actual users live. Other reports they used were from the Bureau of Labor Statistics, American Cancer Society, and the Census Bureau. NCI also gathered qualitative data from stakeholders who regularly use English-speaking personas. These personas have been used by NCI since 2009. They organized one-on-one and team meetings with NCI staff and asked how the existing personas were used and what was missing from them. They also asked about Spanish-speaking Cancer.gov users and how their needs differed from English-speaking users. The qualitative feedback enabled the UX team to assemble realistic stories that resembled actual Spanish-speaking users of the NCI site. While conducting usability testing with community health workers and Latinos diagnosed with cancer, NCI identified the following cultural values, beliefs, and language practices of Latino users. Respeto (Respect): Demonstrating respect towards authority figures, such as doctors. Familismo (Family): Recognizing the role families play in healthcare decision-making. Confianza (Trust): Creating a warm and friendly approach. Personalismo (Personal Connections): Focusing on building a personal connection with users and taking emphasis away from the healthcare institution. Fatalismo (Fatalism): Attitudes about diseases and health conditions such as cancer and how cancer treatment is worse than the actual disease. Not having experience with the U.S. healthcare system or using health insurance for the first time could also lead to fatalistic attitudes. Monolinguals: Monolingual Spanish-speakers will often compare similar types of websites and content before making a determination about the quality of the translation. Bilinguals: Whenever possible, bilingual site visitors compare the English and Spanish versions of websites in an effort to validate translation accuracy. Co-Browsers: Co-browsing is common among bilingual and monolingual users who depend on each other to identify which pages to visit and navigate and whether the content and translation is accurate. To address language and cultural needs, the NCI team identified basic site functions they could use to meet user needs. For example, language toggles allow users to navigate between Spanish and English content. Bilingual dictionaries allow monolinguals and bilinguals to look up basic and complex cancer terms in both languages and to hear pronunciations in either language. Dictionaries also help Latino users understand concepts that may not be typical in non-U.S. Latino cultures, such as healthcare exchanges, denial, appeal, and co-pay. Fourteen personas were created. Nine personas are about members of the general public: patients, friends, family, co-browsers, and those interested in cancer information. Three are about healthcare professionals: community health workers, general practitioners, and nurses. The final two are Cancer Information Service Call Center Spanish-speaking staff and patient navigators. The personas are portraits of Spanish-speaking users who seek health and cancer-related information, specifically from Cancer.gov/espanol. Each persona contains details about a typical user’s goals, motivations, background, behavior, and habits. 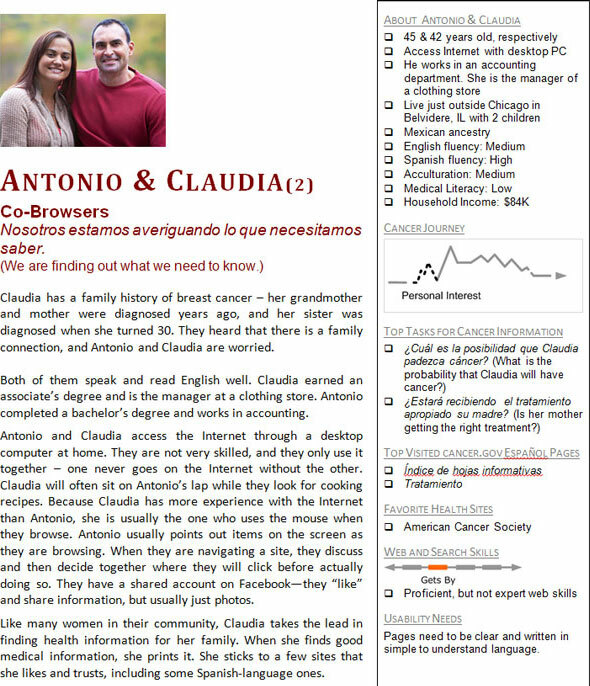 Following the same layout as NCI’s English language personas, the description includes a summary of information that provides characteristics about that group’s demographics: Latino ancestry, acculturation and language preference, medical literacy level, co-browsing behaviors, cultural values, typical cancer-related tasks for that persona, and Internet and search skills. 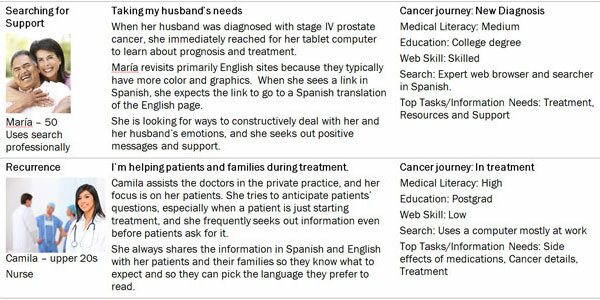 Although the personas were created to represent the needs of Cancer.gov/espanol visitors, they can also be used for other health websites. The language preferences, cultural values, co-browsing behaviors, health beliefs, acculturation levels, and user needs are the same across many types of websites that provide medical or health information. _Information about this case study was provided by an article for User Experience Magazine, written by Silvia Inéz Salazar, Audience Research and Informatics Laboratory Manager at NCI, and Jennifer Romano Bergstrom, Ph.D., User Experience Research Leader at Fors Marsh Group. Salazar and Bergstrom also presented this information at the User Focus 2014 conference, and slides from their presentation are available._ New UX content is always being added to DigitalGov, and our Usability Starter Kit provides a list of UX tools.